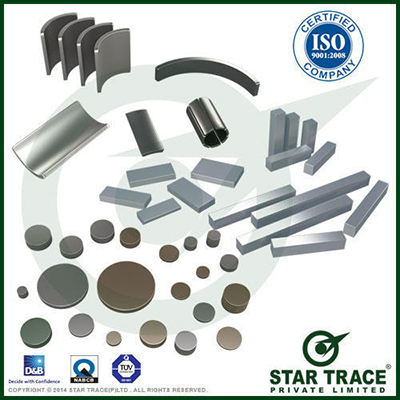 Rare Earth Neodymium-Iron Boron Magnets, Samarium Cobalt Rare Earth Magnets: Star Trace Pvt. Ltd.
Neodymium magnets (Nd-Fe-B) are composed of neodymium, Iron, Boron and a few transition metals. Samarium Cobalt magnets (SmCo) are composed of samarium, cobalt and iron. These rare earth magnets are extremely strong for their small size, metallic in appearance and found in such simple shapes as rings, blocks and discs. In general, the elements are melted together and milled into a power that is dry-pressed to shape in the presence of a magnetic field. The material is then inte-red, aged, ground to dimension, magnetizem and tested. They are called "rare earth" magnets because the elements of neodymium and samarium are classified as such in the lanthanides section of the Periodic Table of the Elements. Magnetic separator, linear actuators, microphone assemblies, servo motors, DC motors (automotive starters), Computer rigid disc drives, hammer bank printers, and speakers. For as pressed material, tolerance on the thickness (direction of magnetization) is +/- .127mm. Other Dimensions are +/- 2.5% or +/-.254mm, whichever is greater. According to Magnet Materials Producers Association (MMPA) standards, visual imperfections such as hairline cracks, porosity and minor chips are commonly found in sintered metallic magnets. A chipped edge is considered acceptable if no more than 10% of the surface is missing. Cracks are acceptable as long as they do not extend across more then 50% of of pole surface. Rare earth magnets are very brittle and very strong magnetically. Therefore, it is crucial to handle these magnets with extreme care to avoid personal injury and damage to the magnets. Fingers can be severely pinched between attracting magnets. Magnets can be chip if allowed to "Jump at" an attracting object. It is highly recommended that when constructing rare earth magnetic assemblies, they be magnetized after assembly. Since rare earth magnet material is prone to chipping and cracking, it does not lend itself to conventional machining methods. It can, however, be abrasively ground, but only with the use of liberal amounts of coolant. The coolant minimizes heat fracturing and the risk of fires caused by oxidized grinding dust.